Two years ago when her husband was laid off, aspiring artist Ann Constantino Beck was thrust – literally — into the driver’s seat. 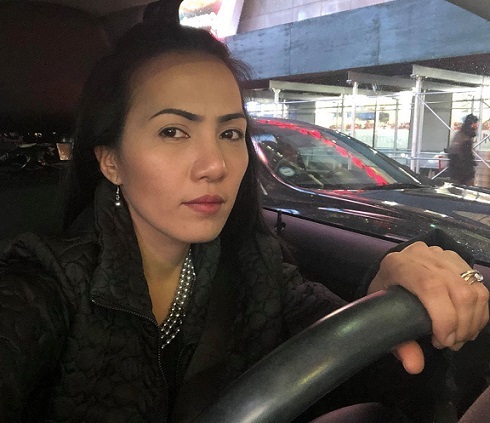 She became an Uber driver, and for several months, was the family’s breadwinner. Ann is among the 14 percent of women across the country who drive for the popular ride-sharing service, according to a Forbes article. 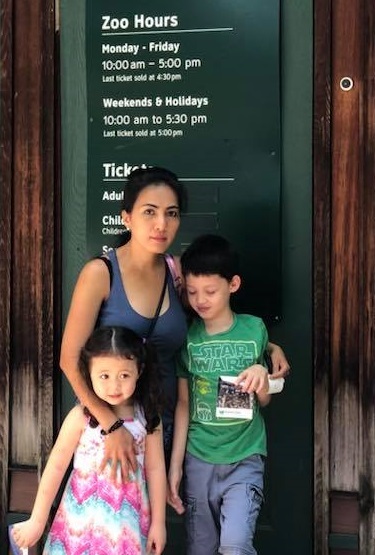 Safety may be the biggest concern for women, but for Ann, 40, a mother of two young children, it is abusive passengers that get her thinking how much longer to continue being an on-demand driver. With Uber, ratings and tips make the driving experience a thrill of a ride. You get the good and the bad — boorish passengers but also kind riders who sometimes give tips more than the actual fare, or give them in cash. “Every passenger is a new learning experience for me, but overall I like meeting people,” she told The FilAm. With children Tristan and Lauren at the Queens Zoo. Listening is a skill Ann has in reservoir. She listens to riders talk about frustrations on the job, at home, and wherever they find them. Usually, she engages the passenger in short conversations, without revealing too much about herself or offering profound advice that touches on religion or politics. She gets an earful of politics, as in the time immediately after the 2016 elections where her pool of passengers included two Republicans and two Democrats. Chatting up passengers is also a way to get high ratings because the driver comes across as “friendly,” and makes riders “comfortable.” Ann’s 5-star ratings hinge on making passengers happy. There is music, bottled water, and candies in her car. There is also a puke bag for those who need one. Here’s Ann’s rule of thumb: “If you do it for 16 hours a day, you may be able to make $5K to $6K a month, but only if your body can take it. What you make depends on how much hours you put into it.” Some drivers do it to supplement income, or to finance hobbies like travel or expensive clothes. Ann said many of the drivers who trained with her appeared to be immigrants and people of color. 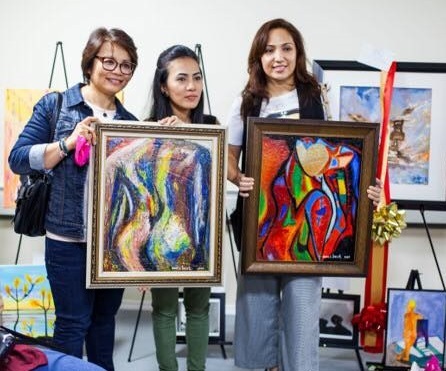 Ann curates an exhibit by the International Women Artists.